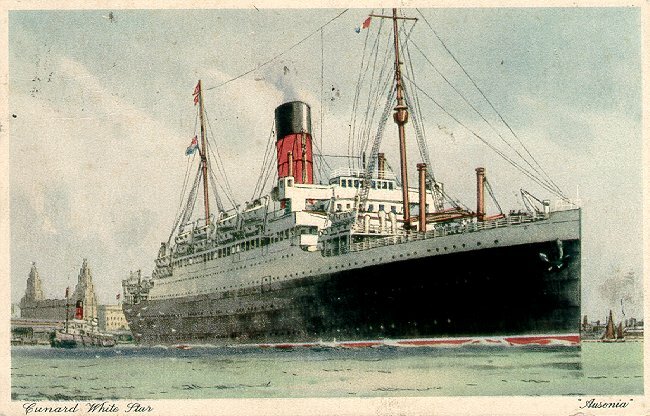 Ausonia was the third of Cunard's six post-World War I "A Liners" for the Canadian service. Like Ascania, she was built by Armstrong, Whitworth & Co. of Newcastle, the only shipyard to build more than one of the "A Liners". Launched in 1921, Ausonia made her maiden voyage, Liverpool-Montreal, on 31 August 1922 and in 1923 was moved to the London-Canada route. Refitted for the new cabin/tourist/third configuration in 1927, Ausonia was requisitioned as an armed merchant cruiser in September 1939. Purchased by the Navy in 1942, she was then converted into a heavy repair ship, but retained her Cunard name. She was decommissioned in 1964, and was scrapped in Spain the next year.